Of all the rooms in your home, the hallway has a unique role – it’s the space that welcomes you home after a long day and the one that gives your guests that all important first impression. So whether you are looking for decorative hall furniture, need some practical hall storage ideas, or simply some hints and tips to help keep your entrance clutter free, your choice of furniture plays a key part of creating your ideal home. Hallways come in all shapes and sizes, some long and thin, others wide and spacious. Whatever space you have, here at the Wooden Furniture Store we have plenty of smart hallway storage ideas to help. From small tables, hall units and cupboards. there's plenty of inspiration for you to make the most of the space you have. Once you step through the front door, across the threshold and into your home, the hall is the room that greets you. It’s also the space that your guests will see as their first impression of your home, and by extension, of you. Given this fact, it is surprising that many of the UKs hallways are simply treated as connecting spaces between the outside world and the first ‘main’ room of the house. Often little more than a dumping ground for shoes, coats, hats, keys and anything else you can think of, many entrances are relegated to become a glorified storage area, and often not enough thought or care is put into their arrangement or décor. So why not give your home (and yourself) a well deserved lift and treat your hallway to a makeover – start with a fresh coat of paint or new wallpaper to brighten and lift the surroundings. Smart storage solutions will help keep everything neat and tidy, and a well chosen rug gives you a reason to remove those dirty shoes, and store them away in a shoe storage unit. We think that every home can benefit from a neat and welcoming entrance, but how do you go about planning the perfect hallway - well, it depends on many different factors. Here’s our simple guide on how to get started. Step One: What material do you prefer for your wooden hallway furniture? An ever-popular choice, light oak has always been an effective material and oak hallway furniture in general is sleek and hardwearing enough to withstand some of the bumps and scratches of family and friends bustling in and out, usually (if our house is anything to go by) in a mad rush. Our bestselling solid oak furniture range, Mobel Oak, is a perfect example of this blend of practicality and solid construction, with a number of high quality, extremely functional items in the range. Its smooth lines, sturdy build and versatile features make light oak, and the Mobel Oak range a natural choice. It the budget is a little more modest, then Aston Oak is a terrific value alternative. If you are looking for something a little more characterful, than walnut hall furniture is an interesting alternative. Growing in popularity, the dark, rich wood often creates a stylish contrast to a wood or tiled floor and often blends modern stylings with the traditional look and feel of the walnut wood. To reflect this growing trend, we have two beautiful walnut ranges, each with a number of items. For those that prefer a more artistic feel then the art-deco inspired Shiro Walnut range would be of interest, with rounded edges and subtle design features. The Mayan Walnut range is a more up to date, modern collection, designed with sharp clean lines and loads of practical features. For those who look for a more formal, traditional feel then our La Roque mahogany is going to be a perfect choice. No longer the preserve of the stately home, mahogany furniture creates that impressive first impression, but with more a modern design style that ensures that your home doesn’t feel dated. The range is full of contemporary design and style features that look perfect in any home, no matter how traditional or modern it might be. If you are hoping to create a more individual and unique style to your entrance, then recycled or reclaimed timber is an interesting alternative as it is more colourful and less predictable than more regular materials such as oak. Our Urban Chic collection makes a real statement. The metal box frame gives it an industrial feel, whilst the reclaimed wood provides a talking point for your guests as you welcome them into your home. Step Two: What furniture do you need for your hallway? Clearly, the answer to that question depends largely on two things; first, what size and type of space you are working with and secondly, who will be using it. One of the most obvious items to consider is a suitable shoe storage - a real must-have for a busy family home. There’s nothing more likely to create a sense of clutter and mess than piles of shoes clogging up the hallway, so get them all tidied away and out of sight. 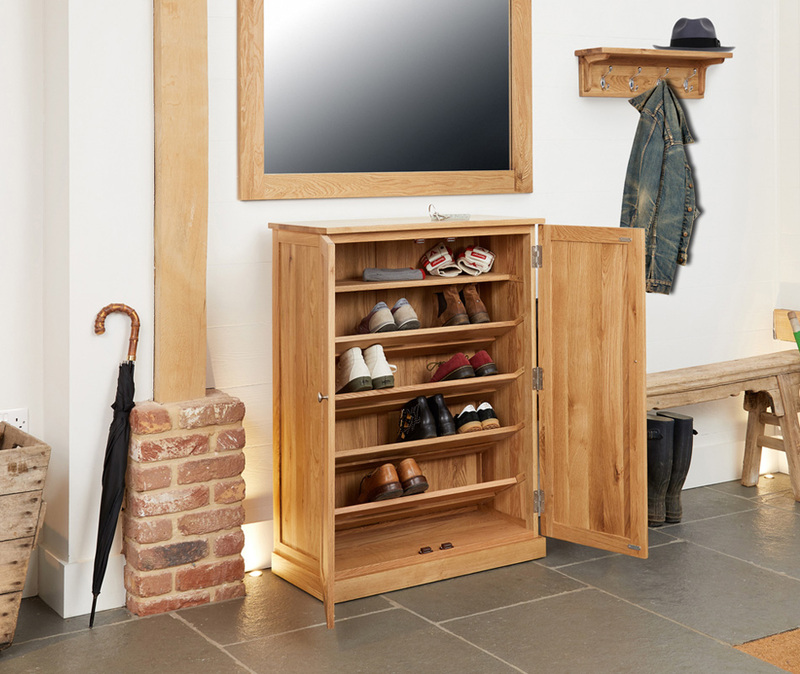 At the Wooden Furniture Store we have plenty of shoe storage options available, from oak shoe cupboards to tall shoe storage units, designed to fit into a narrow area when space is at a premium. A shoe storage unit is a great start; but most homes need more to help keep the hallway free of clutter. The next most popular item are our selection of hallway console tables. These are all designed to look great but also to provide useful storage for those smaller items such as car keys and phones. Another useful home styling tricks is to use mirrors to create a sense of space, especially important for a small hallway and you can add the final piece to complete your hall storage with a wooden coat rack. You can see our selection of mirrors and wooden coat racks here. Once you’ve found the items you are looking for then you’re just 5 to 10 working days away from having a tidy hallway. Our in-stock items are delivered promptly and efficiently, with our delivery team taking your new furniture into your home with care and consideration. For more information on how they do this, see this real delivery story. Step Four: Looking for inspiration and ideas on how to choose the perfect hall furniture? Not quite sure what it is you need? Well, hopefully we can help. Over on the blog we have several articles on how to choose hall storage as well as and plenty of others offering hallway storage ideas – essential reading for anyone seeking ideas, tips and inspiration. Don’t forget that we’re here to help – our specialists can advise and offer recommendations; which material, layouts or hallway furniture storage will be best suited for you. Chat to us now and we’ll be pleased to help - the fastest way to speak with us is by using the orange button in the bottom right of this (and every) page. Chat to us now, we’d love to help.